Honda Accord JDM used engine for sale. Honda F23A 4 cylinder Honda Accord engine for sale. 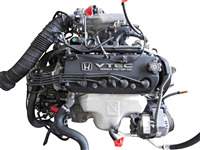 This engine fits 1998, 1999, 2000, 2001 & 2002 Honda Accord.